One thing about Occupy protestors is that they are not camera shy. After a while, a photographer becomes comfortable, knowing that he or she can pause for a moment to compose the photo - a luxury that is rare in street photography. 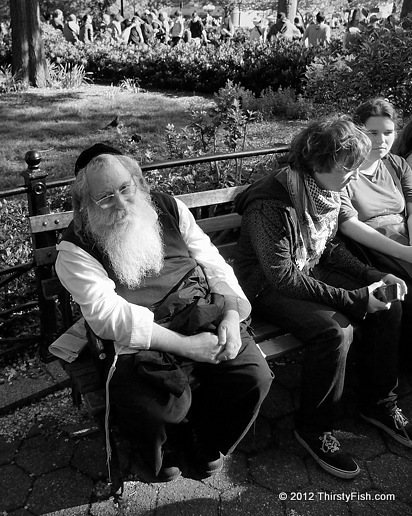 So I stood in front of this older Jewish gentleman with a wide angle, took a second to compose and got the look you see in the photo. Until I got that look, it didn't occur to me that despite being surrounded by 15,000 protestors, he might have been there, resting on the park bench, after his daily walk. I apologized with a gesture, and moved on. Update: Some of you thought that I was weird for assuming that an Orthodox Jewish man would participate in Occupy protests. I can not think of any other cause or event that has drawn a crowd as diverse as the Occupy Movement. During my short photo trips to Occupy events, I have met with Buddhist Monks, Catholic Clergymen, Evangelists, Jewish Rabbis, Islamic Scholars, Atheists and people of other faiths. Although these individuals were at Occupy events in a non-official capacity, many expressed their support to the movement and non-violent resistance. I have also spoken with people with diverse political backgrounds; everyone from Anarchists, Marxists and Libertarians to former Tea Party members and Conservatives. Empathy transcends religion or politics.